Oregon State University and Peet’s Coffee today announced the Peetnik Pathway to College Program, a tuition reimbursement plan that gives thousands of the specialty coffee company’s employees access to OSU’s top-ranked online education. The program opens the door to potential life-changing career advancement possibilities for many of the 5,000 Peet’s Coffee workers nationwide – known as Peetniks – who wish to earn a bachelor’s degree. Oregon State University and Peet’s Coffee, The Original Craft Coffee, today announced the Peetnik Pathway to College Program, a tuition reimbursement plan that gives thousands of the specialty coffee company’s employees access to OSU’s top-ranked online education. 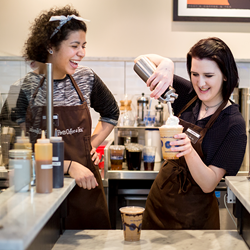 The program opens the door to potential life-changing career advancement possibilities for many of the 5,000 Peet’s Coffee workers nationwide – known as Peetniks – who wish to earn a bachelor’s degree. The collaboration empowers eligible employees to enroll in one of more than 20 rigorous undergraduate programs delivered online through Oregon State University Ecampus. All benefits-eligible Peet’s Coffee employees who work part-time or full-time, do not already have an undergraduate college degree and meet university admission requirements can enroll in OSU’s nationally ranked programs such as business administration, liberal studies, sustainability, Spanish and human development and family sciences. By serving workers across Peet’s Coffee, including those at more than 270 of the brand’s coffee bars, this program aims to produce thousands of college graduates from coast to coast who otherwise may not have had the opportunity to pursue an undergraduate degree. It is designed to support working professionals by providing enhanced work-life flexibility and a robust academic experience that positions them well for potential career advancement. Peet’s will reimburse each eligible employee up to $5,250 in qualified tuition and fees annually, with federal financial aid and any applicable scholarships also contributing to reduce student costs. Upon being reimbursed following each academic term, a Peetnik will pay as little as $15 per each successfully completed course credit. Since 1868, Oregon State has been committed to its land grant mission to serve people in Oregon and beyond. This inclusive initiative was developed with that goal in mind. OSU Ecampus is regarded as one of America’s leading providers of online education thanks to high levels of student engagement and the credentials of the OSU faculty who develop and teach Ecampus courses. For the third straight year, OSU’s online bachelor’s programs are ranked in the top 10 in the country by U.S. News & World Report. OSU Ecampus has also been honored nationally in recent years for its excellence in faculty development as well as the innovative use of technology to boost student success. To encourage student success, everyone in the Peetnik Pathway to College Program will have access to many of OSU’s essential academic resources, including student success counselors, an academic adviser, library access and career services. The OSU College of Business, which already offers a popular business administration bachelor’s program online, is developing a new retail management option to address retail industry education needs. Eligible Peet’s employees can apply to Oregon State University now as part of the program and begin taking Ecampus classes this fall. OSU’s fall term begins Sept. 20. About Oregon State University Ecampus: Through comprehensive online degree programs and courses, Oregon State Ecampus provides learners with access to a high-quality education no matter where they live. Ecampus delivers more than 50 undergraduate and graduate programs and more than 1,100 classes online to learners in all 50 states and over 50 countries. Oregon State is consistently ranked among the nation’s best providers of online education. Learn more about OSU degrees online at ecampus.oregonstate.edu. About Peet’s Coffee: Peet’s Coffee is a U.S. specialty coffee company founded by Alfred Peet in 1966 in Berkeley, California. Mr. Peet grew up in the coffee trade and moved to America from Holland after World War II. His coffee style was unlike anything Americans had ever tasted before – small batches, fresh beans and a superior quality roast that is rich and complex. Mr. Peet’s influence on the artisan coffee movement inspired a new generation of coffee entrepreneurs, including the founders of Starbucks. Today, Peet’s upholds its commitment to delivering a premium product by continuing to source the world’s best beans, hand-roast in small batches, and craft every beverage by hand. Peet’s asserts a strict standard of freshness to ensure optimum flavor, including a unique direct store delivery network serving over 14,000 grocery stores to personally vet the freshness date on every bag. Peet’s is dedicated to growing its business through its retail, grocery and e-commerce channels while maintaining the superior quality of its coffee. Peet’s is also proud of its status as the first LEED® Gold certified roastery in the United States. For more information, visit peets.com.